At Winnie King, MD Aesthetics and Wellness, we are dedicated to providing our patients with products that are safe to use, highly effective, and healthy for the body. Count on us to give you the latest products for healthy makeup, anti-inflammatory drinks, skin care, and more. Visit us today in Shenandoah, Texas to find amazing products that will work for you. GinGarTum stands for Ginger, Garlic and Tumeric. We are excited to be a local reseller of this spicy anti-inflammatory drink. The amazing benefits of these key ingredients have been well documented. Just 2 ounces is all you need but good luck stopping! Yumm! Drop by for a free sample. Dr. Zein Obagi is a world renowned dermatologist who has revolutionized the specialty of skin care. His professional skin care products, sold only to trained physicians, are designed to work with your body to correct, nourish and maintain beautiful skin. We did our research before choosing a skin care line and found ZO Skin Health to be the company that delivers consistent results. Call for an appointment to learn how this amazing skin care line can help you look the way you feel! Dr. King offers her own supplement line. 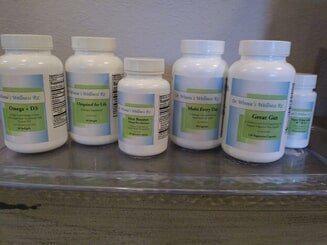 Each is a customized blend personally selected by her to help in weightloss and your overall health.